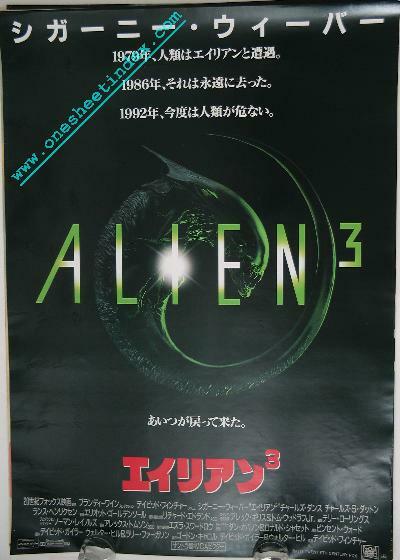 Starring Sigourney Weaver, "Alien3," the third chapter in the acclaimed science-fiction series, opened in 1992. Twentieth Century Fox presents a Brandywine Production of a Film by David Fincher, "Alien3," starring Sigourney Weaver. David Fincher directs from a screenplay by David Giler & Walter Hill and Larry Ferguson, from a story by Vincent Ward, based on characters created by Dan O'Bannon and Ronald Shusett. The film is produced by Gordon Carroll, David Giler and Walter Hill. The executive producer is Ezra Swerdlow, and Sigourney Weaver is the co-producer. Charles S. Dutton, Charles Dance and Lance Henriksen co-star. Returning to the role she created in 1979, Sigourney Weaver once again stars as Warrant Officer Ripley, whose fierce battles with an unstoppable alien foe have been portrayed in "Alien," "Aliens" and now "Alien3." In this new adventure-thriller, Ripley is stranded on a remote prison planet inhabited by unarmed ex-convicts, who have nothing but their wits to fight back with when the Alien once again goes on the attack. Following her feature film debut in "Alien,"
Weaver went on to star in such diverse films as "Eyewitness," "The Year of Living Dangerously" and "Ghostbusters." More recently she starred in "Aliens," "Gorillas in the Mist," "Ghostbusters II" and "Working Girl." She received Academy Award nominations for Best Actress in "Aliens" and "Gorillas in the Mist" and a third nomination for Best Supporting Actress in "Working Girl." She is also a noted stage actress, having earned a Tony nomination for "Hurlyburly." Co-starring opposite Weaver are Charles S. Dutton as Dillon, Ripley's key ally in her fight against the Alien, Charles Dance as Clemens, the compassionate medical officer of the colony, and Lance Henriksen reprising his role as the android Bishop. Director David Fincher makes his feature film debut, having been responsible for a number of stylish, ground-breaking music videos. Among the artists who have been captured on film by Fincher are Madonna ("Vogue," "Express Yourself"), George Michael ("Freedom '90"), Don Henley ("The End of the Innocence") and Paula Abdul ("Straight Up," "Cold Hearted"). Award-winning cinematographer Alex Thomson ("Excalibur," "Legend") is the director of photography, Oscar-winner Norman Reynolds ("Raiders of the Lost Ark," "Star Wars") is the production designer, and Terry Rawlings ("Alien," "Blade Runner") is the editor. The music is by Elliot Goldenthal. Creature effects are by Alec Gillis and Tom Woodruff, Jr. ("Aliens"); George Gibbs, who won Oscars for "Indiana Jones and the Temple of Doom" and "Who Framed Roger Rabbit," is the special effects supervisor, and Boss Film Corporation is doing the visual effects, led by four-time Oscar winner Richard Edllund ("Raiders of the Lost Ark," the "Star Wars" trilogy).